How does your brain feel right now? Does it feel a bit cluttered with too many thoughts and ideas? 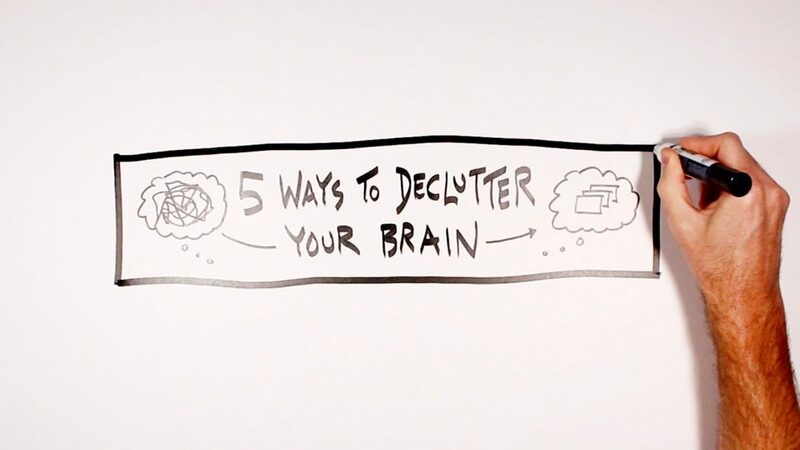 I’ve been there (many times) and today I’d like to share five ways to declutter your brain that I’ve found to be helpful. The overarching goal: to get ideas out of your head and onto the page so that you can then do something useful with those ideas. First up, grab a pen and a notebook and simply write whatever words and sentences come to mind as fast as you can, without worrying about what makes it onto the page. This is know as stream of consciousness journaling, which I first heard about in a high school language arts class (hi Mrs. Long!) and then was exposed to again thanks to Julia Cameron’s book The Artist’s Way and her description of Morning Pages. The point of this activity is to give your brain a place to dump whatever thoughts, memories, and preoccupations about the future that are currently cluttering it up. The point is not to immediately review that journal entry – that can do more harm than good because of the free-form nature of it. 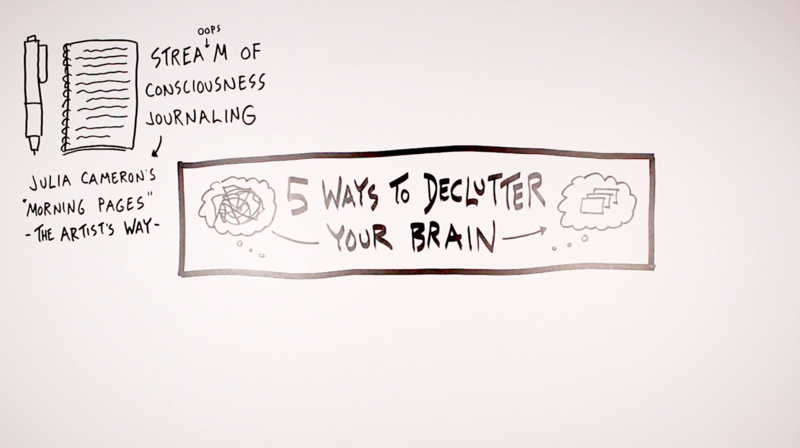 So once you’ve done your stream of consciousness journaling, close your notebook and move on with your day. 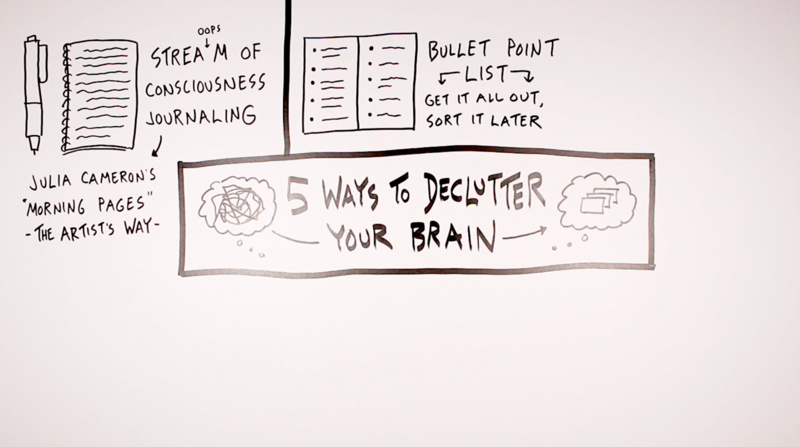 Our second approach for decluttering your brain is a bit more organized and actionable: the simple bullet point list. Give each individual idea its own bullet point, and describe it in as short a phrase as possible. You can then either do some sorting and figure out follow-up steps right there in the moment, or put that list away and come back to it later. The helpful thing with this one is knowing that each idea has been captured, that you won’t lose any of those ideas, and that you can return to them when you’re ready. If you’d prefer a more modular and flexible approach to getting ideas out of your head, then consider using index cards. Grab a stack of them, and on each one get down one of the ideas that you’re thinking about. Feel free to capture each idea in whatever format best suits it – maybe a short phrase will do, maybe a quick sketch would be better, or even a small diagram. The power of this approach is that after capturing all of those ideas, you can then sort and group them, moving the cards around as needed, depending on what follow-up action you decide is best. That modularity and flexibility is what makes this one of my favorite approaches for capturing lots of ideas at once. 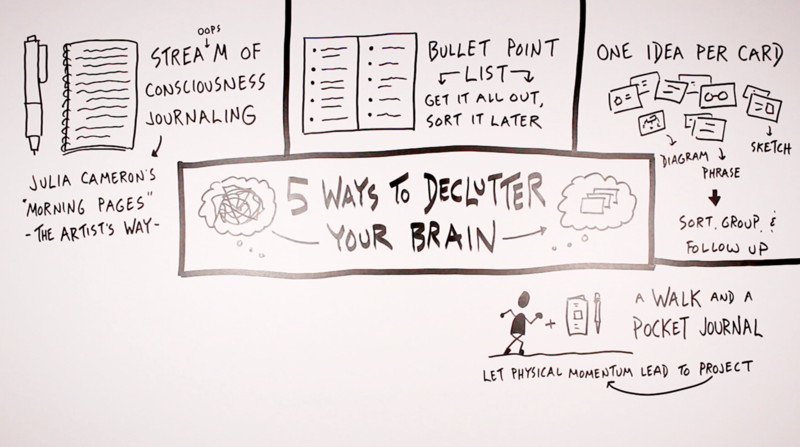 Moving paper around is great, but moving your entire body around can be even more helpful. So put some shoes on, throw a small notebook in your pocket, and go for a walk. While walking, capture each idea as it comes to you. The physical motion will get more blood flowing to your brain, and the slowly changing scenery will help to give you a new perspective on whatever it is that you’ve been thinking about. In that way, you’ll be letting your physical momentum lead to idea momentum so that you can move forward with whatever project or task is occupying your thoughts. 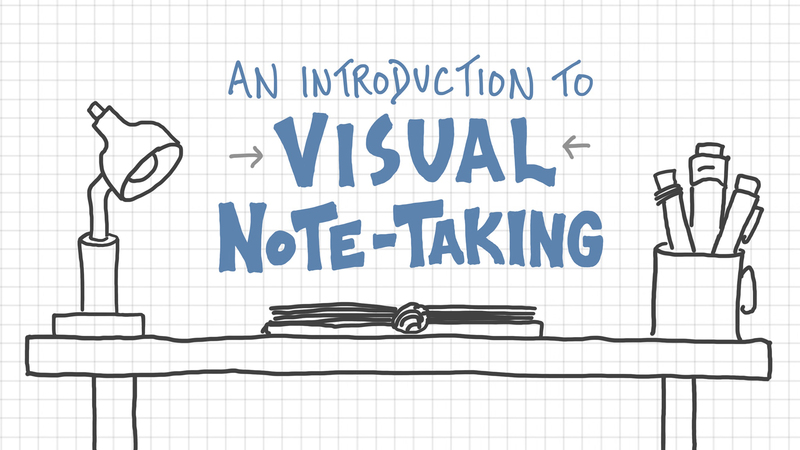 So far we’ve been talking about fairly small materials: journals, index cards, and small notebooks. 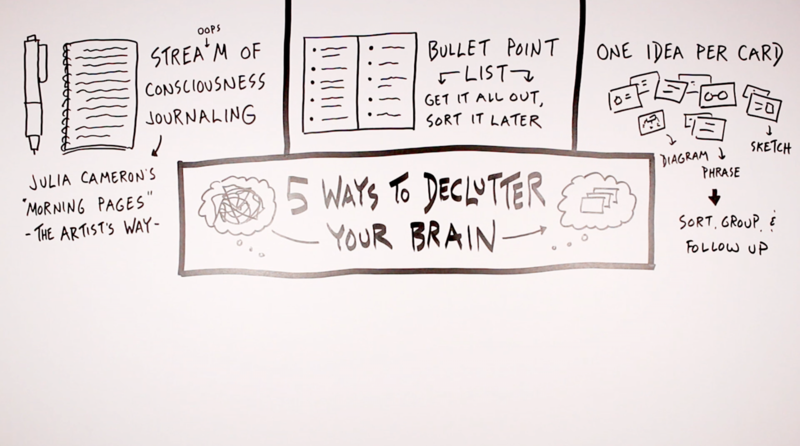 In this final technique we’ll move in the opposite direction, toward large-scale poster paper and a big mind map that not only captures all of the ideas you’re thinking about, but also maps the connections between them. With this approach, as each new idea makes it onto the page, you add lines to connect the new idea to any previous one that it’s related to. 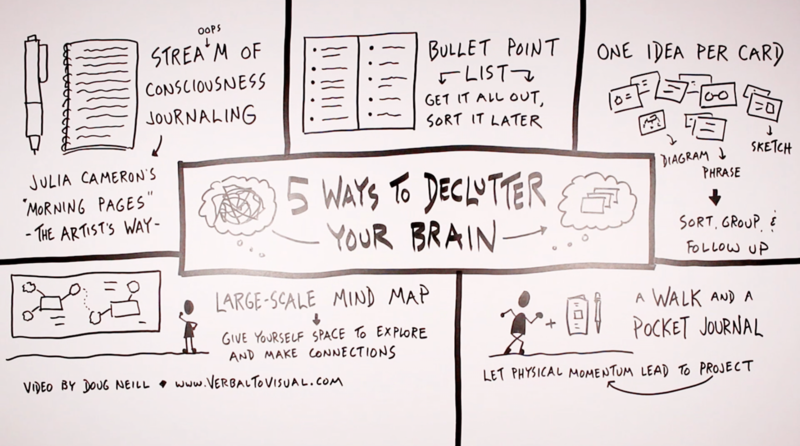 Those connected ideas, along with the ability to walk back and forth in front of that large-scale mind map, will allow you to see your thoughts from a new perspective, and better determine what to do next with them. So if you’re currently in need of some decluttering, give one (or more) of the techniques above a try. Use those techniques as a starting point, and experiment with any adjustments that might help you more effectively get ideas out of your head and onto a page so that you can do something useful with those ideas. You can also check out our full course library here. Good luck as you fine-tune the decluttering techniques we explored in this post. I hope you find an approach that works well for you.